I sometimes joke that the worst parts of my life so far have been elementary school and the marriage part of my first marriage. But there’s also the year I turned 15. Three months before my birthday, my favorite person in the world – my dad – died. Because he was the rabbi and the synagogue owned our house, we had to move. My best friend Nancy announced that her family was also moving – out of town. And I ran for an elected position in my synagogue’s youth group, but a girl two years older than I am got elected. That wasn’t surprising, as older kids frequently won these elections. With this girl, though, things were more complicated. 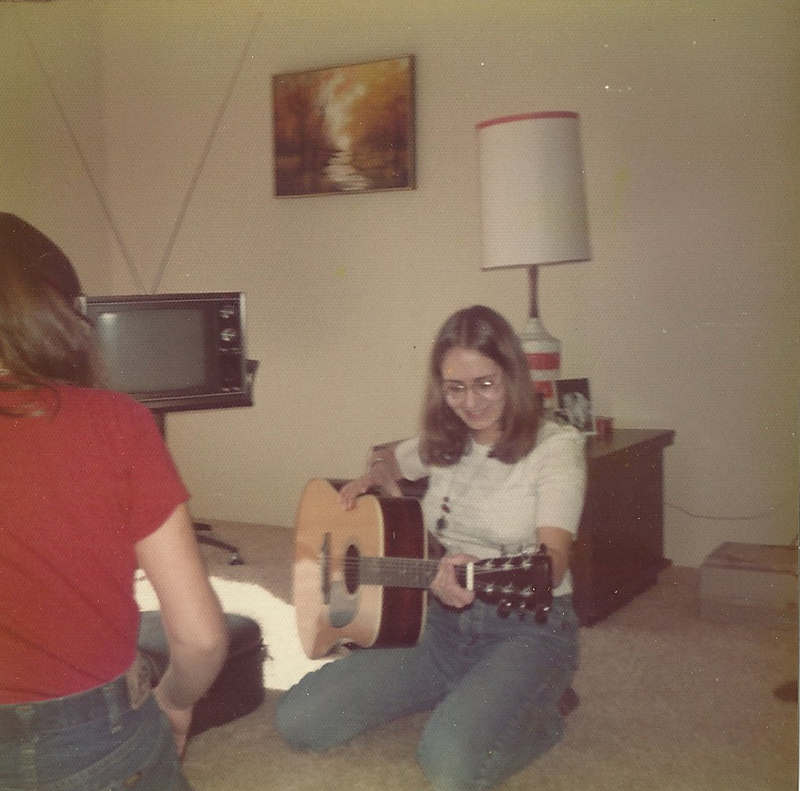 Like me, she played guitar, and like me, she was youth group co-songleader. We were equals on that front, but I was the more accomplished musician. My ear was better, my intonation was better and I could feed out chords and learn songs more quickly. The rest of my life was a mess. But this was the one place I could shine. I also took the “co” in my title seriously, doing everything possible to make sure my counterpart was equally able to share the sunlight. This is the guitar I got in December of the year referenced in this story. It lived under a bed in Phoenix, Arizona, and I bought it for $300 with confirmation gift and saved babysitting money. This picture was taken just after I got it. You can see it was a pretty joyful moment. She was also a Mean Girl straight out of Central Casting. When Dad was alive, I had minor protection, because who wanted the rabbi to think badly of them? As a widowed teacher’s daughter, I was an ordinary nobody. Or, as CoSong and her Minions saw things, fair game. That summer, I got shipped off to Kutz, the Reform movement’s national camp for three weeks. It was harvest time for a huge crop of new songs, and I spent several hours a day in songleading class learning them all. My 12-string guitar took a little bit longer to tune than everyone else’s sixers, but our teachers – Doug Mishkin and Ramie & Merri Arian – didn’t mind. We learned upwards of 100 new songs that summer. I was going to teach them to religious school students during the next school year, working off the scholarship the synagogue had given me to attend camp. What I was really excited about, though, was teaching them to the youth group. All the other TYGs (Temple Youth Groups) would have to wait until conventions, when the regional songleaders would teach the TYG songleaders. We’d be able to sing them right away. I came back to our new home – a townhouse on top of a hill. It provided several sensory experiences. In the winter, it shook when the wind whistled through it. In the upstairs bathroom, you could turn a timer switch next to the light, triggering a percussive ticking sound and a blood-red light that turned the white walls pink. The light was a heat lamp, so at least it had that going for it. The townhouse also featured dreadful avocado green and brown shag carpet that covered the floors and stairs, my holding-cell-sized new bedroom (my former room had run the length of the house, from the front of the garage to the back of my father’s study) and an electric stove. We’d always had gas. I’d loved turning the knob to bring the flame to life, and missed the whooshing sound of the oven turning on. In September, the youth group held songleading tryouts. There was no question about who was most qualified. Three of us were vying for two spots. One girl was a year older than me. She played and sang passably, but not as well as CoSong or me. My guess was that it would be me and Sweet Girl, because CoSong already had an officer position. Or, if Sweet Girl blew the audition, it would be me and CoSong. I taught a song I’d learned at camp. I don’t remember what the others did. The Executive Board, including CoSong and her best friend, Minion, went behind closed doors to deliberate. I knew CoSong didn’t want me, for the same reasons some kids pull the wings off of flies and hold magnifying glasses over them. Our TYG president was a lovely, self-possessed girl to whom I ascribed a highly-developed sense of fairness. So, given my qualifications and the fact that CoSong already had an elected position, I felt confident that she and the rest of the board (Minion excepted) would shut Mean Girl down and give Sweet Girl and I the job. The board came back with its decision, along with the news that I’d mistaken the president’s highly-developed sense of fairness for a highly-developed sense of something else. CoSong approached, with Sweet Girl trailing behind her. “We need you to teach us all the songs you learned at camp,” CoSong said. I was still taking it in. I looked at her. I looked at her co-songleader. Then, I uttered the words that sealed my status as youth group pariah until the next election cycle. I love this. So well knit, like a song. Gee, what surprise. Awww, thanks, Judy! I want to keep working with this one some, but it was a start!